Welcome to week 45 of our ongoing (yet intermittent) series about refined sugar & me in 2017. Since last we checked in with our intrepid heroine (yup, that’s me! ), I’ve been prescribed medication with the unfortunate side effect of increased appetite and weight gain. 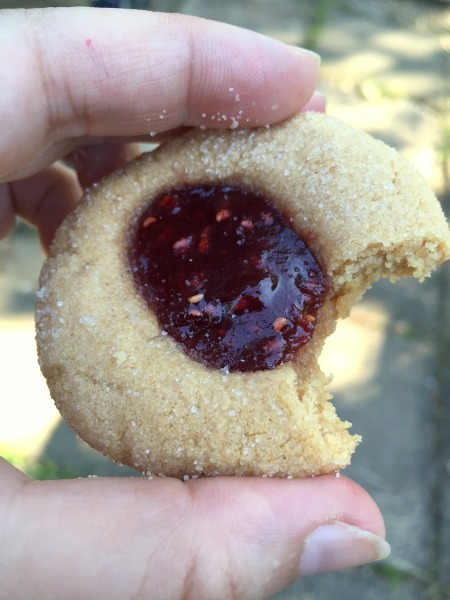 So… in the 9 weeks since we last talked refined sugar and me, I’d first lost another pound… but then gained about six pounds back fairly quickly before I realized what was going on there and got back on track. Since then I’ve lost four of those again for a net gain of just one pound since we last talked… putting me right back at 17 pounds down total since the beginning of the year. Dizzy yet? I am. But this is a good reminder that you never really know what’s going on with people or what challenges they are facing, right? So that’s the semi-bad news, but here’s the good! Typically Halloween heralds the beginning of the long holiday slide, right? It starts with sneaking just one tiny candy bar out of your kid’s bag or that bowl for the trick-or-treaters, devolves into a pile of little empty wrappers, and segues right into that Thanksgiving pie, the seasonal ALDI sea salt caramels, and holiday cookie exchanges and parties. OK, maybe the specific sea salt caramels thing is just me, but they really are quite dangerous. You have been warned. This year I allowed myself to try one Reese’s peanut butter cup after walking around trick-or-treating in the insane cold for two hours, just to see if they’re as badly good as I remembered. They kind of are — but, strangely, after being off desserts for a good part of the year (I think the last straight up dessert or candy I had was back in February? ), eating just the one left me with no impulse to eat more. That’s pretty awesome. I never would have thought I’d lose my taste for dessert, but: Here we are! 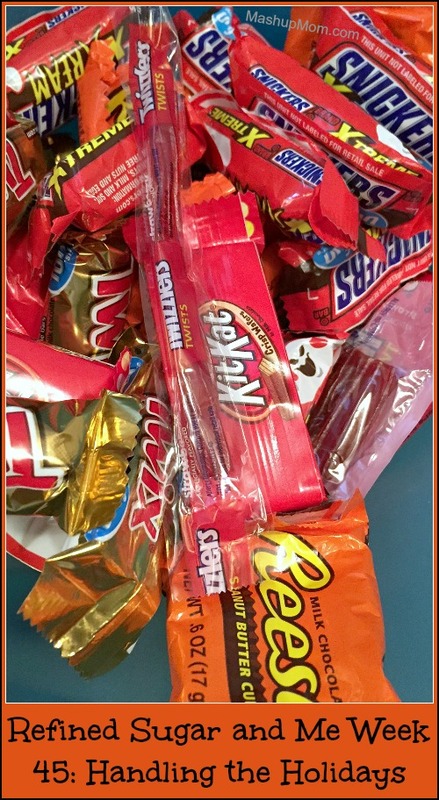 And yes, we do still have quite a bit of Halloween candy in the house. Mr. 10 has been having a piece occasionally as “dessert” after dinner, but he always asks. At this rate I think it may last him until next year, which I’m fine with. Do you choose the occasional place or time to indulge? Do you fill up on healthier options before heading out to a holiday party? Do you resign yourself to just falling off the wagon until the New Year? Think about having a limited allowance of indulgences, and about where it’s most worth it to you to spend those — whether that be on your mom’s famous apple pie, your coworker’s yearly Christmas cookies, or those seasonal sea salt caramels. 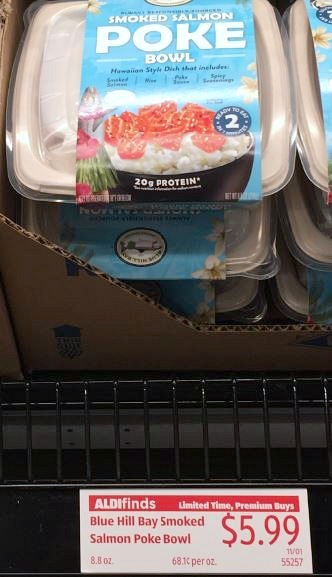 Me, I’m actually doing worse trying to stay away from things like these Poke Bowls at ALDI than from the more obvious temptations such as cookies and candies — so it’s probably a good thing they are a limited time buy! These suckers are so good, but have 13g of added sugar (in the sauce). There’s a reason sweet + spicy is a thing, right? This is one example of where I’m now allowing added refined sugar as a sometimes food — when mixed into sweet + savory dishes like these Poke bowls, or in something like the Korean style ground beef & spinach rice bowls I made this past weekend. I’ve gone back and forth on this, but have finally settled on the realization that I like to cook and experiment with different cuisines too much to cut myself off from the flavor options you get from combining sweet + savory or sweet + spicy — and that I’ll take these types of flavor combinations over a straight up sweet dessert any day. You might decide to “cheat” occasionally with really good chocolate or ice cream; here’s where I’m choosing to indulge occasionally instead. One Reese’s peanut butter cup contains 11g sugar and 5g protein and leaves me quite hungry; one Poke bowl contains 13g sugar and 20g protein and is a satisfying lunch. Which would you choose? 😉 Real food meets real life: It’s not just a tagline! This year is all about slowly figuring out my own pitfalls, and mine may or may not be the same as yours. How are you doing on your own healthier eating plan — and what have you found that helps you stay on track? I hear ya on those sea salt caramels. Luckily for me, our Aldi seems to sell out of them really quickly and they haven’t been there the last few times we’ve grocery shopped. Thanks for tackling a tough topic by the way! Thanks! My ALDI has had the darn caramels in stock every time, lol. Just yesterday I was running errands and I needed a snack in order to finish grocery shopping before I headed home to make dinner. I chose a healthy/organic PB crunch bar, but even that seemed too sweet to me (and I do like sweets). It had protein though, which is what I was looking for. Do you have any favorite quick snacks that you can pick up at the store when you just need something to hold you over until dinner? Preferably something more savory than sweet? I like hummus and baby carrots, apples and cheese or PB, nuts, string cheese — something with protein for sure! Most bars taste too sweet to me now as well, although if you are going to do a bar the KIND nut bars aren’t as bad (like 5g sugar). For me it’s the giant Toffifay at Aldi !! those are so addictive I can eat the whole giant box in one sitting. And then……. they go on clearance after xmas!! Why, Aldi????? thanks again for a great update! I never needed to lose weight. I grew up with basic foods: meats, poultry, and fish cooked from raw, sides cooked from dry grains, potatoes, miscellaneous salads. We had some cookies and candy at home, but I never wanted a lot of them. I do like ice cream, some cakes, pies, pastries. I am 44, 5’7″ and 132 lbs after birthing three children. I expanded my menu here in the US mostly by fresh produce available year round. I didn’t have this luxury when I was a child. I can afford only main food on my budget. If I have a dessert/candy/cakes/donuts, those are freebies that I get since I started couponing. Unfortunately I still like the sweets, but am eating them without really tasting them or they just don’t taste that good to me anymore. I used to always love Reeses Peanut Butter cups and now they don’t taste that appealing. I need to figure out how to cut the carbs but being gluten free, I don’t have a lot of options. I’ve looked at the keto diet and am intrigued — but actually did try Atkins years ago with MashupDad and cannot convey to you how terrible it made me feel :-/ . Maybe someday I’ll give low carb another try, but that day is not today. Yes! I did see that Jill is doing Keto as well. It is working for her just as it works for me. I am 1 lb away from my goal weight! That last pound just wants to stick around! LOL Keto is a bit different from Atkins. Good luck to you and I look forward to watching how you do in 2019. Congratulations — that is awesome! I continue to intermittent fast and have kept off my weight. I cannot keep up with my workouts since everyday brings a different schedule. I generally reserve Saturday as my day to indulge in a treat. It has worked pretty good so far. I feel good, I am stronger due to working out regularly (need to get back on track) and I have been using My Fitness Pal to enter my food. I have not been good about this during November, so back to the good habits for December. I have promised myself I will NOT gain any weight in December and have a plan set. 😉 Good for you Rachel and your new lifestyle! Keep up the good work! I so need to cut out refined sugar. I love sweets and I love carbs as well. I have steadily gained weight in the last year since going through menopause and eating too much sugar and carbs. I am 5:5″ and at 168 lbs. I feel miserable. I have been walking around the track and the treadmill a few times a week. I would like to lose at least 30 pounds and your series has given me the inspiration that I can do this!!! Rachel, are you still doing no sugar? I’ve always been a sugar fiend. In January, work started supplying apples, oranges, nuts, granola bars, etc. and asked people not to bring in sweets. Since January, I have lost 13 lbs and lost my craving for sugar. I feel and look so much better! Just wondering how you are doing. I am 90% of the time — I’m down 27 lbs total now, and really need to do an update. Life keeps getting in the way. 🙂 So glad it is working for you!